such a beautiful technique! I love this, the haiku and the photos are also amazing!! what a creative blog! Beautiful! Very nice black and white images! Really lovely work. I love visiting your site. Beautiful words, images and art!! The circus does seem to be a symbol of running away! Lovely haiku! Great final line in the second haiku! A personal challenge/reprimand! And love the atmosphere in the last photo! There's a special way of getting beautiful pics across here. Great pics and a wonderful haiku set to accompany! Nicely Carol! And you ended the post with human failures. Wonderful Haiku. And I LOVE the Art - I need to get back into class to refresh technique - and I need to get back to my Watercolor Mentor so I can develop more confidence in my ability to work in the medium. 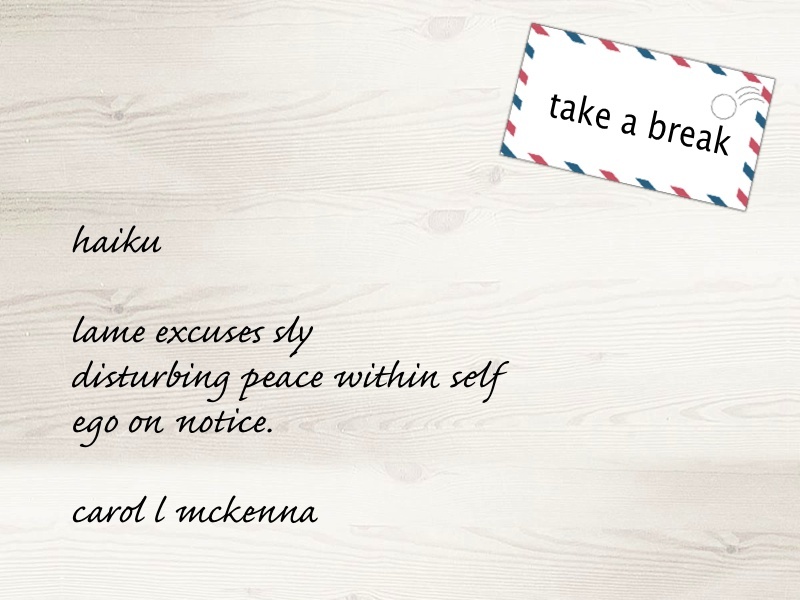 Thank you for sharing - and thank you for being part of Haiku Friday. Your flowers are so relaxed and free- love the soft colors too! Happy PPF! Great haiku. Ah, to run off to the circus. Great idea. Thanks for all your sweet sharing today ! well done Carol... I love "ego on notice"
Your circus haiku reminds me of my dreamscape at night! Ego on notice....I have to do that with mine when she's staging a hissy fit about something or other! Love the photos - I am partial to B&W. your flowers are free flowing and beautiful today Carol! Love your reflections photo. Oh yes Carol, some days make one feel like running away to join the circus! Beautiful work.... I love the idea of using a twig to paint! Your painting is sweet - reminds me of a Picasso. Carol, you are so willing to try new techniques. This is gorgeous. I have a book by an artist who does pen and ink and watercolors. Most of her works have some pen work in them. Sometimes after I have done watercolors, especially of flowers, I feel that they need the black pen. (Never have tried a piece of a tree twig, though!) Thanks for the get well wishes. I finally went to the real doctor to get his opinion and it is a very tight ligament. It is a minor injury gotten by moving heavy furniture around. Being in Las Vegas for the winter it is hard to feel the different seasons. OOPS I meant 450th follower! Pretty painting and photos! I am looking forward to spring and flowers ... is it really still January?! like the silvery colors in the reflections and water! Lovely picture, and very creative post : well done ! There seems to be a theme of restlessness in your haikus...for me, it would be the perfect time for a roadtrip! Good luck getting some variety going...winter can be that way! What a sweet falling flowers painting. Very lovely. Your circus haiku was perfect. There are many days I've wanted to run away with my crazy thoughts. Beautiful reflections, lovely words and a great start for my morning, Carol!! Thank you! Hope you have a wonderful weekend! Enjoy! I love the quote. I never thought of LBJ as a pacifist in any thoughtful way. Your painting is great. I have seen that technique before but have never tried it. It is lively and with these grey days the color is most enjoyable. Have a colorful weekend. I love the flower painting! So charming and whimsical. Congrats on getting a spot in the class you wanted to take! 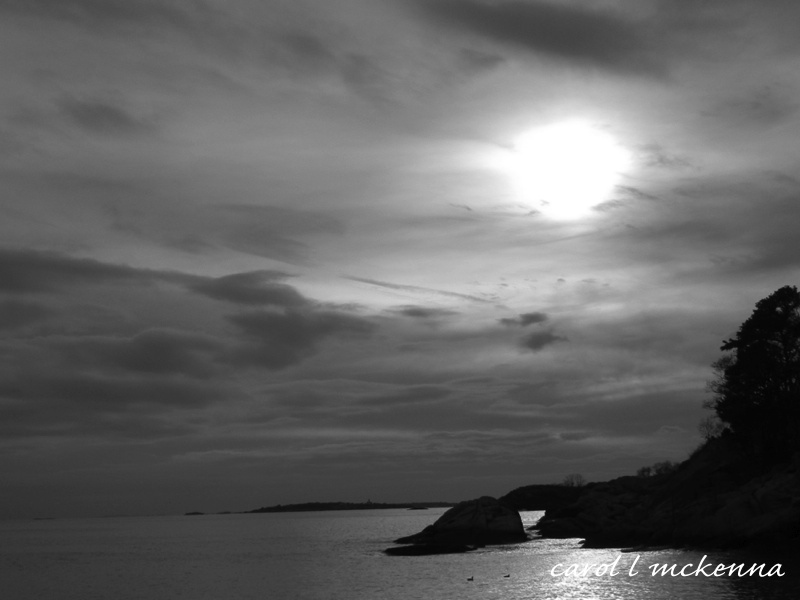 Lovely black and white scene, with great detail and a wonderful sky! Your bright and cheerful art, peaceful photos and spot on haiku made my day!! That black and white photo is my favorite. I really hope it is framed and hanging on your wall somewhere! 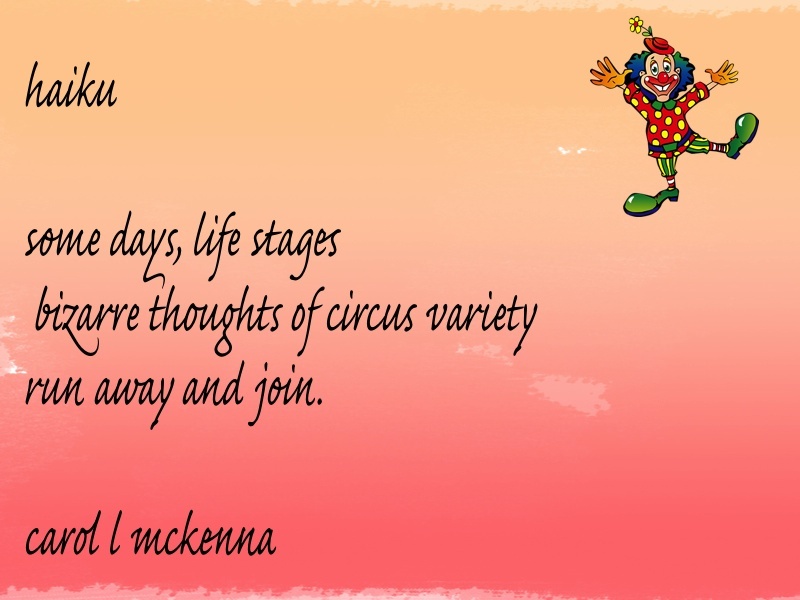 Your circus haiku took my thoughts in new circles. Thank you. And I love the citation at the end. It needs repeating. Your painting of flowers is very attractive. I like the creative haiku and the black and white shots are very beautiful. 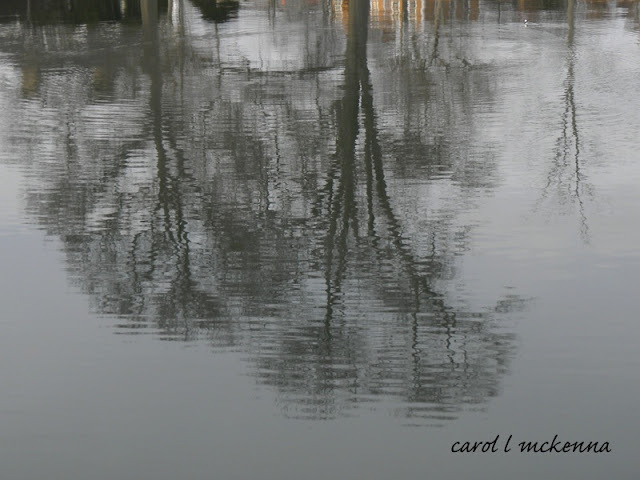 your art , your photos, your words, and your poetry is so inspiring Carol. I don't know WHY I wasn't following you but I have now rectified that :)Happy PPF, and thanks for visiting my blog. Lovely BW photos ... an realistic direction of circus as compared to busy everyday lives! Thank you for sharing. So pretty and watery - all of them! LOL! 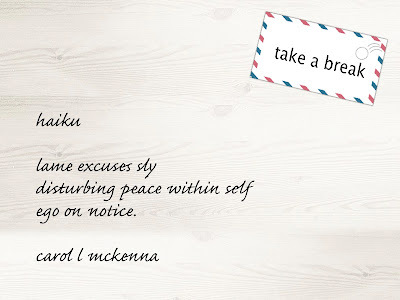 Loved the Ego haiku...really good Carol. going to an art class! today's offerings fill my heart. i particularly love the photo. have a lovely weekend, carol. Carol, these photos are beautiful! Really like your cheerful painting. There is such a peaceful feeling to all your art pieces and haiku poems. Blessings! What an inspirational idea to paint with a tree twig and indian ink! I want to try now. There's something very pleasing about using ink, it produces such strong colour. I am very impressed with the painting you did - it is beautiful and has a dreamy quality to it that I love. Fantastic painting, and reflection photo! Have a great weekend! Interesting technique and great result. Love the movement in this. I'm leaving this comment, hoping that you will be able to read it--or perhaps you have already run away to join the circus! Of course... I LOVE the falling flowers! And the haiku as well! Love your painting and your photo is fabulous! Happy PPF! Lovely painting and tree reflection! And very nice monochrome landscape! Great black and white and reflection photo! Hello Carol! Such a rich post this is. I fall into your pictures and paintings, and love your haiku. Yes. I will run away with you and join the circus! Speaking of the circus... have you read the Night Circus? An amazing book that I think you might enjoy. Have a great weekend! loving your wonky bouquet! and the use of twigs for painting. really looking forward to all you create in your new class. thanks for your beautiful photographs and haiku, so lovely to visit you always! The painting is so pretty. Very unique technique, thanks for sharing! I love your painting and your beautiful pictures. I am so glad that you were able to take the painting class. It is always so exciting to learn something new. Belíssima imagem do reflexo...gosto da frase final, embora seja uma triste realidade. Beijos!